Stearic acid ( or ) is a saturated fatty acid with an 18-carbon chain and has the IUPAC name octadecanoic acid. It is a waxy solid and its chemical formula is C17H35CO2H. Its name comes from the Greek word στέαρ "stéar", which means tallow. The salts and esters of stearic acid are called stearates. As its ester, stearic acid is one of the most common saturated fatty acids found in nature following palmitic acid. 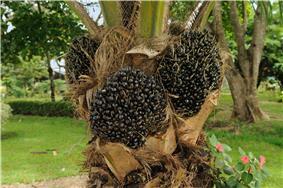 The triglyceride derived from three molecules of stearic acid is called stearin. Stearic acid is obtained from fats and oils by the saponification of the triglycerides using hot water (above 200 °C). The resulting mixture is then distilled. Commercial stearic acid is often a mixture of stearic and palmitic acids, although purified stearic acid is available. Fats and oils rich in stearic acid are more abundant in animal fat (up to 30%) than in vegetable fat (typically <5%). The important exceptions are cocoa butter and shea butter, where the stearic acid content (as a triglyceride) is 28–45%. In terms of its biosynthesis, stearic acid is produced from carbohydrates via the fatty acid synthesis machinery wherein acetyl-CoA contributes two-carbon building blocks. In general, applications of stearic acid exploit its bifunctional character, with a polar head group that can be attached to metal cations and a nonpolar chain that confers solubility in organic solvents. The combination leads to uses as a surfactant and softening agent. Stearic acid undergoes the typical reactions of saturated carboxylic acids, a notable one being reduction to stearyl alcohol, and esterification with a range of alcohols. This is used in a large range of manufactures, from simple to complex electronic devices. Being inexpensively available and chemically benign, stearic acid finds many niche applications, for example, in making plaster castings from a plaster piece mold or waste mold and in making the mold from a shellacked clay original. In this use, powdered stearic acid is mixed in water and the suspension is brushed onto the surface to be parted after casting. This reacts with the calcium in the plaster to form a thin layer of calcium stearate, which functions as a release agent. When reacted with zinc it forms zinc stearate, which is used as a lubricant for playing cards (fanning powder) to ensure a smooth motion when fanning. In compressed confections, it is used as a lubricant to keep the tablet from sticking to the die. Stearic acid is also used as a negative plate additive in the manufacture of lead-acid batteries. It is added at the rate of 0.6 g per kg of the oxide while preparing the paste. It is believed to enhance the hydrophobicity of the negative plate, particularly during dry-charging process. It also reduces the extension of oxidation of the freshly formed lead (negative active material) when the plates are kept for drying in the open atmosphere after the process of tank formation. As a consequence, the charging time of a dry uncharged battery during initial filling and charging (IFC) is comparatively lower, as compared to a battery assembled with plates which do not contain stearic acid additive. Fatty acids are classic components of candle-making. Stearic acid is used along with simple sugar or corn syrup as a hardener in candies. Stearic acid is used to produce dietary supplements. In fireworks, stearic acid is often used to coat metal powders such as aluminium and iron. This prevents oxidation, allowing compositions to be stored for a longer period of time. 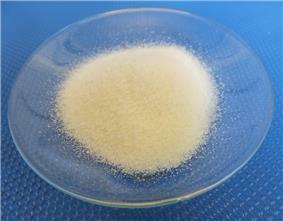 Stearic acid is a common lubricant during injection molding and pressing of ceramic powders. It is also used as a mold release for foam latex that is baked in stone molds. An isotope labeling study in humans concluded that the fraction of dietary stearic acid that oxidatively desaturates to oleic acid is 2.4 times higher than the fraction of palmitic acid analogously converted to palmitoleic acid. Also, stearic acid is less likely to be incorporated into cholesterol esters. In epidemiologic and clinical studies, stearic acid was found to be associated with lowered LDL cholesterol in comparison with other saturated fatty acids. These findings may indicate that stearic acid is healthier than other saturated fatty acids. Stearic acid is part of a control mechanism for mitochondria. There is a transferrin receptor that binds stearic acid, giving signaling function and has been tested in the HeLa human cancer cell line. Flies that exhibit Parkinson's like symptoms resulting from mitochondrial defect improved and survived much longer when fed stearic acid. ^ Susan Budavari, ed. (1989). ^ a b c d e f g h Lide, David R., ed. (2009). ^ a b c d "stearic acid". Chemister.ru. 2007-03-19. Retrieved 2014-06-15. ^ a b c d e Seidell, Atherton; Linke, William F. (1919). Solubilities of Inorganic and Organic Compounds (2nd ed.). D. Van Nostrand Company. p. 677. ^ Vargaftik, Natan B.; et al. (1993). Handbook of Thermal Conductivity of Liquids and Gases (illustrated ed.). CRC Press. p. 318. ^ a b c d von Sydow, E. (1955). "On the structure of the crystal form B of stearic acid". Acta Crystallographica 8 (9): 557. ^ Tsenga, Wenjea J.; Mo Liua, Dean; Hsub, Chung-King (1999). "Influence of stearic acid on suspension structure and green microstructure of injection-molded zirconia ceramics". Ceramics International 25 (2): 191–195. ^ Emken, Edward A. (1994). "Metabolism of dietary stearic acid relative to other fatty acids in human subjects". American Journal of Clinical Nutrition 60 (6): 1023S–1028S. ^ Hunter, J. E.; Zhang, J.; Kris-Etherton, P. M. (2009). "Cardiovascular disease risk of dietary stearic acid compared with trans, other saturated, and unsaturated fatty acids: A systematic review". American Journal of Clinical Nutrition 91 (1): 46–63.